Rarely have I ever been as hesitant to write a review as I have been to write this one. 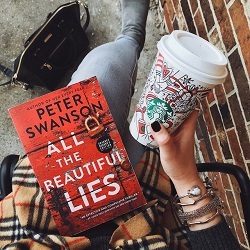 After absolutely loving HER EVERY FEAR (Swanson’s 2017 release), Peter Swanson’s ALL THE BEAUTIFUL LIES was one of my highly-anticipated 2018 reads; unfortunately, my reading experience not only fell flat, but was so genuinely uncomfortable and disturbing that I’ve long wrestled with whether or not I even want to write this review. I went into this book well aware, based on its plot description, that it would have a component involving a taboo relationship, but I could never have predicted the total focus this book would place on illicit relationships between adults (often adults in the role of guardian) and young people. Had I known this in advance, I wouldn’t have chosen to read this book - I take full responsibility for not having done enough research before diving in. But given that this book did appear on my Instagram - and given my genuine aversion to its content - a review is warranted. My only request of you, the reader: please read this review keeping in mind that I have the utmost respect for the author, the publisher, and for all readers whose opinions on this book differ from my own. To my mind, there are two kinds of “disturbing” when it comes to fiction: there’s disturbing that is compelling and insightful, oriented towards commentary on issues that apply to real life, and then there’s the kind of disturbing that just makes your skin crawl, leaving you feeling as though you’ve dabbled in something you really shouldn’t have. ALL THE BEAUTIFUL LIES falls into the latter camp. But let’s back up for a moment: I’m no stranger to books with disturbing content—CBTB readers will know that one of my top two favorite books of all time, THE CROW GIRL by Erik Axl Sund, is a genuinely dark and disturbing book covering all manners of horror, from child abuse to sexual assault and much more. So what, then, distinguishes THE CROW GIRL from ALL THE BEAUTIFUL LIES? How can I love the former and take exception to the latter? This is a question I’ve wrestled with over and over, and the best answer I can settle on is this: in THE CROW GIRL, readers are exposed to these horrors through the lens of abject condemnation. There is no blurred line here—the abuses found within the pages of that book are called out for the horrors they are. Misogyny is condemned, child abuse is punished, victims fight for - and rightfully achieve - justice for the wrongs done to them. In short, it’s that first kind of disturbing. ALL THE BEAUTIFUL LIES is another kind of disturbing entirely. Nowhere in the pages of this book is the reader subjected to near the severity of crime that readers experience in THE CROW GIRL, but I found myself deeply uncomfortable with the content I was exposed to. “Uncomfortable”, in fact, is being too diplomatic—I was shocked and genuinely puzzled by the story’s insistence on coming back, over and over, to the repulsive themes at its core. The most generous conclusion I can draw about the content presented in ALL THE BEAUTIFUL LIES is that the author hoped to spark a conversation surrounding a cycle of abuse. The crux of this story is this: a woman begins an affair with her stepson. As the story progresses, readers discover she was involved in a similar affair as a young person, too, and are drawn into this repulsive web of taboo relationships. These relationships are not technically illegal, but they’re most certainly uncomfortable and taboo - and the power dynamics between adult and young person presented within them adds a whole other layer of wrong for readers to unpack. The cycle of manipulation and grooming portrayed here was enough to turn my stomach—the author was certainly effective at portraying how abuse can beget abuse. And that idea - the idea of examining a cycle of abuse - is not in and of itself a bad thing. When portrayed through the lens of commentary on a terrible and very prevalent occurrence, this kind of examination could indeed be quite effective in sparking an important conversation among readers. Where my real qualm with this story came into play was simple: where is the line between commentary and indulgence? I am the first person to say readers and authors alike have full freedom to read and write about whatever they choose - that’s a fundamental freedom that I will always advocate for. But as the consumer of this content, I also reserve the right to be genuinely disturbed by what I’m reading, and to be vocal in my aversion to it. What is the intention behind this story? Are we to read this as a condemnation of the characters’ behavior, or are we indulging in something problematic - something that normalizes relationships that should be identified as troubling at best and abusive at worst? And perhaps most of all, why am I having such a hard time identifying the angle or perspective through which this story is being told? Give me dark and disturbing stories any day, but give me darkness that is insightful and purposeful, aimed at rectifying a wrong by shining a light on it. If you give me a book that portrays manipulative and arguably abusive relationships as sensual and legitimate, though, I cannot be quiet in my concern. I will certainly give Peter Swanson’s next work a try—I absolutely loved HER EVERY FEAR and am saddened that this new addition to his list didn’t work for me.